This striking infographic on inequality in the UK has been widely circulated; but it takes an almost nonsensical approach to its subject data. The result is an interesting lesson in how to mislead with statistics. A graphic which raises more questions than it answers. I'm not so concerned that a campaign group brought out a misleading graphic; more that it was widely shared by people who should have known better. That included campaigners for Scottish independence, arguing the UK was broken and Scotland needed to get out; and the Guardian columnist Zoe Williams, who initially misquoted it as saying the UK had the poorest regions in Europe, not just "Northern Europe". Clearly Williams and others were happy to use a graphic which agreed with what they wanted to say, without applying much scrutiny. The graphic originates from a group called Inequality Briefing, who obtained their raw data from Eurostat (PDF link). In the source data, wealth of regions is defined by per capita income, adjusted for purchasing power, and scaled so the mean value for the European Union is 100. 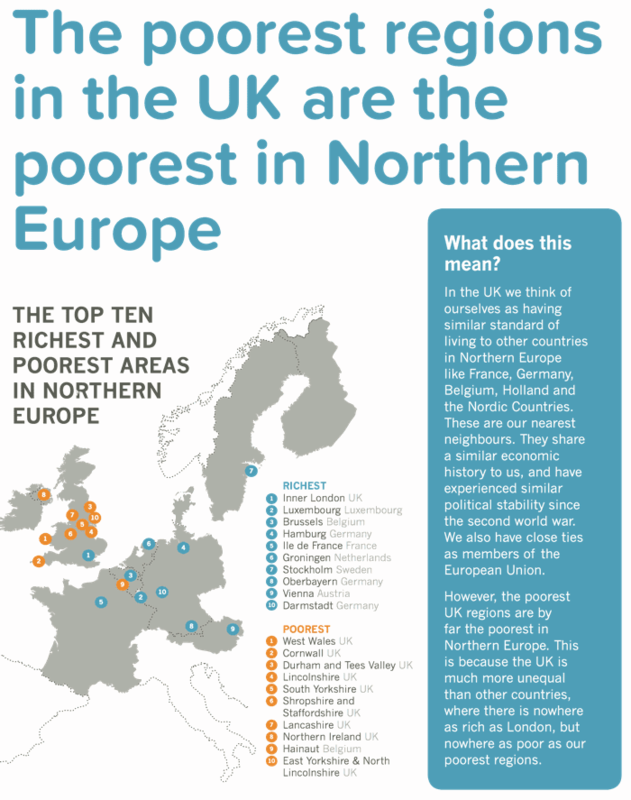 They claim that because the UK has the richest region in "Northern Europe", and nine of the ten poorest, the UK is shockingly unequal. This is a weird way to measure inequality, because it strongly depends on the boundaries of each region. For example, the city of Cambridge is quite affluent, with a median wage of £25,148 in 2011; neighbouring Bury St Edmunds is less so, at £20,540. If Cambridge and Bury make up a "region", it would be of middling wealth. If they are split up, we have a richer and poorer region side by side. As if by magic, apparent inequality has increased without any change in facts on the ground. The UK is split into 37 regions; France, a country of similar population and income, is split into 19. All else being equal, the larger regions in France will tend to smooth out any differences in wealth. Inner London is a tiny, tiny blue dot; Paris is in the large blue blob of Ile-de-France. GDP per capita figures can be significantly influenced by commuter flows. Net commuter inflows in these regions push up production to a level that could not be achieved by the resident active population on its own. There is a corresponding effect in regions with commuter outflows. For example, Kent appears to have a below-average income of 85; but this excludes the many residents of Kent who commute to well-paid jobs in London. By contrast, "Inner Paris" is not a region unto itself; instead, Paris is part of the much larger Ile-de-France region, so the commuter effect is much less. Another bias appears in the convoluted phrase, "we think of ourselves as having similar standard of living to other countries in Northern Europe." England may think of itself as having a world-class football team, but successive World Cups have shown it is not necessarily so. Never mind what "we" believe. What are the facts? We compared the UK to some countries which are richer, and found the UK looks poor by comparison. I doubt Inequality Briefing will be nominated for a Nobel Prize any time soon. As an indication of the true extent of inequality, their method is almost meaningless. In fact, Italy has a similar income to the UK, at 102. If we throw the Italian regions into the mix, Italy comes off worse than the UK, with six out of the ten poorest. The UK has a Gini score of 32.3. 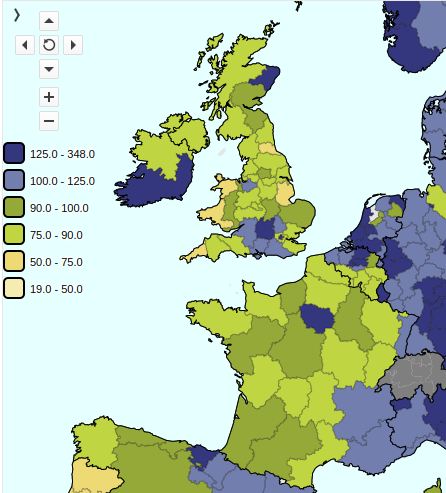 Despite its regional disparities, Italy as a whole does slightly better than the UK, with a score of of 31.9. Ireland (33.9) has a higher per capita income than the UK, but is actually less equal. France (30.6) is more equal than the UK, but not by very much. Looking beyond the EU, the UK is considerably more equal than New Zealand (36.2), Japan (37.6), and the USA (45.0). This isn't terribly suprising; by the standards of northwestern Europe, the UK has low taxes and a weak welfare system, but compared to the rest of the developed world it is somewhere in the middle. The correlation between equality and happiness is not perfect. Belarus (27.2) is more equal than the UK or France, but I would not consider it a more agreeable place to live. If we want a single number measuring quality of life for each country, the standard choice is the UN's Inequality Adjusted Human Development Index. On this measure, the UK ranks 16th in the world, slightly ahead of Belgium (17), France (18) and Italy (23). To be sure, the UK has its problems, and its trend towards increasing inequality is worrying; but indicators for health, education, inequality, and per capita income show it does better than its neighbours in some ways, and worse in others. There is reason for concern, but not despair. On the other hand, if you just want to scare people, throwing together a slick-looking map without a solid foundation will do nicely.